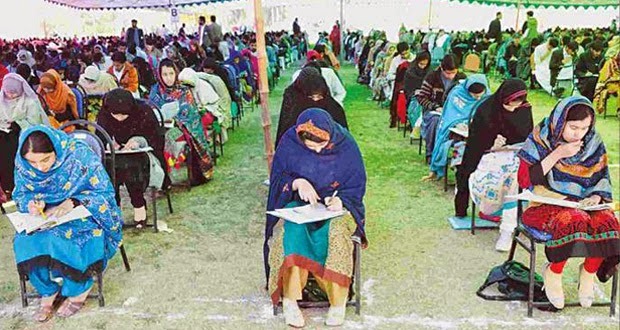 On April 12, recruitment tests for vacancies in the education department of Balochistan started. These tests are being conducted by the National Testing Service in all districts of Balochistan. According to Saleem Kurd, coordinator of the NTS in Balochistan, over 100,000 people have applied for 4,200 vacancies in the education department. All these vacancies are for small-scale jobs of BPS-14 and below. This large number of applicants highlights the issue of unemployment in Balochistan. Unemployment is one of the biggest problems faced by the province – ont that has not received due attention. According to the Pakistan Bureau of Statistics, the unemployment rate is four percent in Balochistan. This value is not only ludicrous but so completely obviously out of touch with reality. The Pakistan Bureau of Statists cannot be blamed for these inaccurate statistics because there has not been any census since 1998 and thus there is no data to reflect the real situation. In reality the unemployment rate in the province is much higher than what official statistics portray. Veteran journalist and editor of Balochistan Express Siddique Baloch says that according to estimates 25,000 people graduate from Balochistan every year and hardly 2,000 of them can secure jobs. He further says that there are four to five unemployed graduates in every other home in the province. That is the reason that the establishment of higher education institutes in Balochistan, in the last decade, has not brought about any meaningful improvement in the socio-economic conditions in the area. People have the opportunity to study but can’t get jobs after completing their studies. Balochistan is a under-developed province and the sources of livelihood for people are either agriculture or private or government employment. Water shortages in the province have crippled the agriculture sector and decimated the economic backbone of rural Balochistan. And this rising unemployment has further exacerbated the economic situation there. According to a report titled ‘Clustered Deprivation’, published by the Sustainable Development Policy Institute in 2014, 52 percent people of Balochistan live below the poverty line. That means that more than half of Balochistan can’t earn even $1.25 per day. Sixty-three percent people of Balochistan are suffering from food security, according to the National Nutrition Survey of 2011. This deplorable situation is a direct result of the lack of employment opportunities for the people of the province. People are unable to earn for their families, resulting in malnutrition and other health-related problems across Balochistan. Government jobs are the primary source of employment in Balochistan. In the past, the population of the province was lower in number and therefore government jobs were easy to get and could fulfil the employment needs of the province. There has been a population increase in Balochistan, just like the rest of the country. And it has become extremely hard to secure government job these days for a common resident of Balochistan. Adding to the problem is the irresponsible attitude of the federal government. More than 3,000 federal jobs allocated to the quota for Balochistan are still vacant. In April 2013, the then caretaker prime minister Mir Hazar Khan Khoso ordered government authorities to commence recruitment on these vacancies. When the PML-N government came to power they imposed a ban on recruitment in federal jobs and deprived Balochistan of its due share. This attitude of the federal government has, to some extent, compounded the unemployment problem in Balochistan. It must be understood that government jobs are not a solution to the unemployment problem. Only jobs in private sector can reduce unemployment in Balochistan. Unfortunately, there are almost no private jobs in Balochistan whatsoever. There are just a few industries located there, but employees are mostly hired from other provinces. There were three textile mills in Balochistan situated in the Quetta, Lasbela and Harnai districts, which provided employment to approximately 20,000 people. Those textile mills were shut down during the Musharraf government by bureaucrats who were indifferent to the sufferings of Balochistan. There is absolutely no strategy by the provincial government to create job opportunities for the people of Balochistan. After announcing a few thousand government jobs every year, the provincial government considers itself absolved of the responsibility. Every year hundreds of billions of rupees are received by the Balochistan government from the federal divisible pool but not a penny is spent for private job creation. This makes the provincial government as big a culprit in this matter as is the federal government. Whenever someone asks the federal government about how they plan to improve the economic condition in Balochistan, the standard reply these days is ‘China-Pak Economic Corridor.’ The federal government proudly claims that the corridor will prove to be a game-changer and change the fate of the people of Balochistan. Unfortunately these are nothing more than hollow claims. The proposed economic corridor will only pass through a portion of the province and can’t change the lives of all the people of the province. Secondly, there is no guarantee that the people of Balochistan will get jobs after the establishment of this corridor. In the past, the Baloch have been ignored in mega projects such as the Saindak copper-gold project, the Reko Diq project and the Gwadar Port project. So, the China-Pak Economic Corridor is not the solution to the employment problems of Balochistan. The question that arises is: what is to be done? Realistically speaking, the provincial government of Balochistan can do wonders to create private job opportunities. Seventy-seven percent of the total budget in FY2014-15 was spent on non-development expenditures in Balochistan. This amount can be reduced by cutting down the benefits of top bureaucrats and ministers. That would save tens of billions of rupees that can be used for job creation. Using that money, the government can provide incentives to businesses to establish small industries in the peaceful districts of Balochistan. The government can provide them land free of cost and can also subsidise their expenses. In return these businesses would be bound to recruit only people from Balochistan. This is a workable suggestion and can be brought into practice in this upcoming budget. The present socio-political setup has given birth to a new elite class in Balochistan. This elite class comprises politicians, bureaucrats, top businessmen and tribal chiefs. They are living luxurious lives at the expense of the misery of the people of Balochistan. This elite class is in no way interested in solving the unemployment problem in Balochistan because an economically deprived population suits their interests. If this status quo persists then it will not take the deprived people of Balochistan very long to revolt against this elite class.